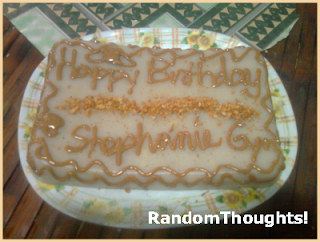 The other day, one of our six grandchildren, Stephanie Gyn, fondly known to us as Panie, celebrated her 6th birthday. She had it in a simple, austere celebration with homemade foods prepared by her mama An An. Panie is a smart, a good dancer and talented kid. Her happy family is very proud of her. Before her birthday, Panie asked her parents to prepare something for her to make it more sumptuous and memorable with balloons and other birthday decors. Gigi, her aunt was kidding her and asked her: "What about if there could be no birthday party, for your parents don't have money yet? Payday is too far." "Ti indi lang ako anay mag-six years old eh. Kun wala sang handa o birthday party eh," (I wouldn't be turning 6 years old then if there's no celebration or birthday party.) replied Panie. "Well, that's enough for awhile," her Tita said, "We want to know your birthday wish." "Ang akon birthday wish: spaghetti, salad, a big cake, soft drinks, balloons, and many gifts," answered Panie uninterrupted. Before I went to work that day of Panie's birthday, I left some money to her aunt Gigi to be given to her mama when she arrives from her house in La Granja. Upon arriving home, I noticed the table was ready. It's full of foods. Picture-taking was already done. 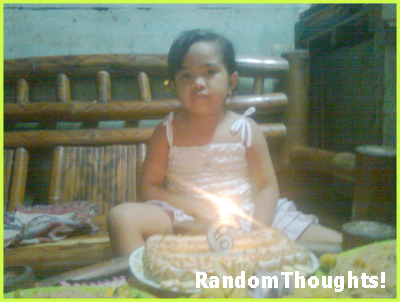 "Our Heavenly Father, we're thankful for this 6th birthday of one of our well-loved granddaughter, Panie. Though the preparation is simple and cheap but yet it's full of thanksgiving, love and care from all of us. "We're thankful also for the love and care of her parent who have brought her up according to thy nurture and admonition. "We pray that Panie will grow up obedient to her parents, be preserved and protected from any sickness and harm and she may have thy wisdom to know what is good and what is evil...and follow that is good." Mama An An lighted the improvised candle. Panie closed here eyes for a moment making a birthday wish, then blew the candle. And we sang, "Happy Birthday!" Everyone was curious of Panie birthday wish. It's eating time. 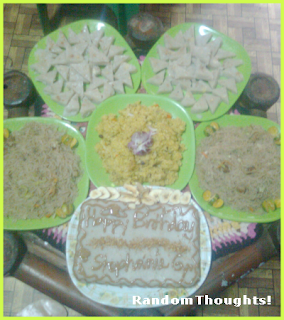 The foods prepared were Bihon Guisado, Maja Blanca, Valenciana (Panie's favorite), cake made of Maja Blanca with peanut butter as icing and with Panie's name, soft drinks. Later that time, Caryssa, best girl friend of our youngest son Toto Jun arrived with spaghetti for Panie. Only my family members, grandchildren were the visitors. My wife shared some of the foods to our closed relatives who just lived nearby. Panie was happy. 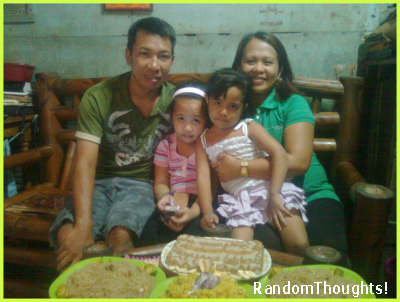 She was happy with her eldest sister Bulaklak, Papa Tipoy and Mama An An. And everyone was happy too. Happy, happy birthday, Inday Panie! Love you! best day of panies life... wish all the best in you loving you always baby panie. may the Lord guide you as you grow. Your granddaughter is so pretty! Hope she enjoyed her birthday. She did. She's very happy though her party was simple and the foods were cheap. Thanks. Mama An An used peanut butter as icing. She's very creative and resourceful. Yes, Panie is a smart kid! It's also good that she has a very selfless wish on love for everyone's hearts. Happ Bday Panie! Very smart kid indeed! I miss those local delicacies and it seems that your grand-daughter had a great time with a lot of foods prepared for her b-day. this are simple but significant wishes for a child. truly she's smart to see the most important things even as a child. belated happy bday, panie. Yahweh bless. Children can have the simplest and most selfless wishes for their birthdays and it is very humbling for adults like us. Happy Birthday to Panie! Your picture made me crave for maja blanca. That's a very beautiful wish from a six year old. Happy birthday, Panie! It's a nice, simple and intimate family gathering. It's a more practical way of celebrating a party. Such a nice wish Panie. Happy birthday! A thoughtful way of celebrating birthdays - blog about them and let the world know. Happy birthday to your sweet little apo. She has such a good heart even at her young age. Love the cake!! Happy birthday Panie!! 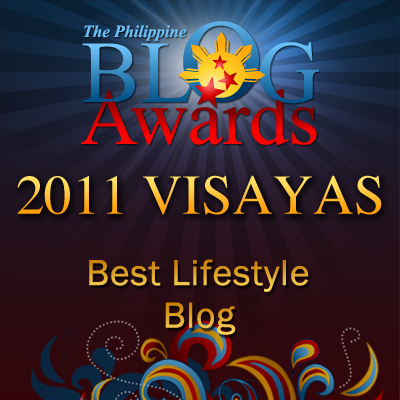 I love that maja blanca cake. Nice one! the simple joys of life.. hope she gets to be a successful person when she grows up..
wow, you have 6 grandkids na, Sir Gil! they are lucky to have you as their Lolo. Belated Happy Birthday to Panie! Happy Birthday Panie. Wishing you good health.At young age she knows what love is already. As usual kids loves spaghetti for their birthday celeb. simple things surely make her HAPPY. Happy Birthday little smart GIRL!!! Nakakatuwa naman, at her young age napaka-ganda ng wish niya for everyone.